Our summer in Duluth is a time well earned and deserves to be met with pure joy, friends, gatherings and good times. For some, however, this also comes with an inner tug of war when balancing health goals and celebration. We want to feel good and feel good about ourselves as we enjoy the warm days to the max. Our celebration with friends often includes food, drink and fun that is coupled with caloric content we would rather not think about. To be clear, I am not suggesting you spend your summer calorie counting, denying yourself and stressing about every delicious indulgence that you choose to experience. I do, however, propose a few ideas to challenge how we think about our celebratory food and drink experiences when it comes to supporting our health and wellness. Especially if you are one for whom food challenges your willpower and offsets your healthy habits and goals. We are entering a time of year when many fruits and vegetables are at their peak of ripeness, taste and nutrition content. We sometimes forget this as we have become a little spoiled with so much variety at our access all year-round. (No, really, it hasn't always been this way.) Not only do I suggest taking advantage of the local produce at the stores or farmers markets, but I challenge you to take those beautiful strawberries and, perhaps, forego the pie. 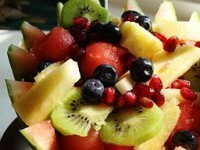 A bowl of mixed fresh fruits can hold its own and be incredibly satisfying. Serve them at potlucks and parties ... No, it's not cheating or lazy. Some of your fellow guests, those who are cutting down on desserts or aren't eating sugar, etc. would say it is extremely thoughtful! Not sure what to add to fill out a meal? Throw in an additional vegetable. We all know we should eat more vegetables, but let's ditch the guideline specifics and just focus on more. I'm not suggesting adding twice the amount of steamed broccoli to your dinner but adding a second vegetable to that steamer or cook and season an entirely different vegetable. This encourages you to eat more and not get bored. It also might help you add some veggies that are not your favorite in smaller quantities. Experiment with ways of cooking and seasoning. You choose one, your dinner mate or kids choose another. Try a veggie that is new to you each week, month ... Okay, fine, even once this summer is still forward progress! How do you do this? When you look at a vegetable and think, "I don't even know what that is or what to do with it" you have found your target! Google it. Look up simple ways to cook and eat it. Ask a grocer. I have heard and been inspired by conversations in grocery stores,especially the Co-op, explaining what something is, when it is in season, what it tastes like, how they cook it, etc. Buy a small amount just to give it a try. When you go to order or grab a delicious treat, take just a moment to assess. Is this something I really want? Am I ordering it because everyone else is? When you do choose it, enjoy it. Take a moment to slow down. Notice the presentation, the taste, the texture. What is it about this you love so much? Share, so your meal mates can share in your joy as well. Split deserts, or yes, even meals. Many meals we eat out can be more than our tummies even feel good about. If you plan to be active afterwards sharing might be a good option if you don't want to choose a lighter entree. Some restaurants are fantastic about splitting meals up for you if you let them know your intent. One suggestion I have is to share dessert with someone who has a faster fork than you. Most of all, enjoy wonderful company, food and celebrations in this terrific short-lived jewel of summer that we have in the Northland. Savor every experience and let it feed your body and soul, rather than just living through it and mindlessly consuming it.